congratulations pardon pour mon anglais. A very good caricature of Flats Jodie. very very awesome! it has that johnny feel! still one of the best al caricatures i've seen. it gets an actual likeness, rather than just relying on his trademarks to sell it. Lots of great stuff here, Jodie. 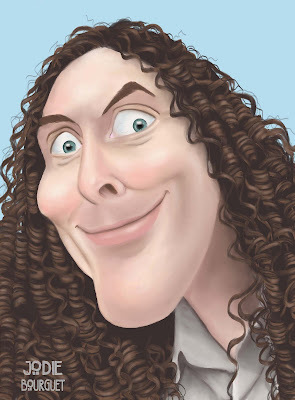 I like this weird Al sans mustache and glasses -I don't know if I've seen one of him like that. On the money! Quick caricature drawn with marker and colored with pastels on paper $25 Digitally painted caricatures on JPEG files $50.